There's only one good thing about winter (IMO), and it's the fact that you have a good excuse to stay in and unapologetically binge watch Netflix. I am not too proud to admit that lately that's pretty much how I've been spending my weekends. 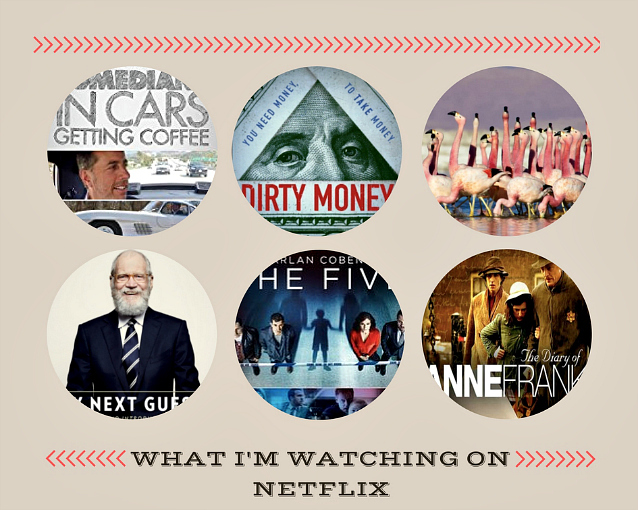 Here's what I've been watching, and I wholeheartedly recommend each and every one. 1. Comedians In Cars Getting Coffee - I discovered this Jerry Seinfeld series on YouTube several years ago but watched only a few episodes (standouts include the episodes with Jimmy Fallon and Miranda Sings). So when I opened Netflix this morning at the gym and discovered that the series had come to Netflix, I was elated. In short, Seinfeld spends a few hours driving around (most frequently in Los Angeles) with a fellow comedian in a vintage automobile owned by Seinfeld himself. While I am not particularly into stand up comedy or vintage cars, this series is both fascinating and entertaining, mostly because Seinfeld's guests aren't trying to be overly funny. Bonus: Seinfeld has an incredibly impressive collection of beautiful, vintage cars. 2. Dirty Money - This insightful look into the greed that ensues in corporate America is eye opening. This addictive investigative series exposes the brazen acts of corporate greed and corruption that most of the public never sees or hears about. Be prepared to pick your jaw up off the floor. 3. Planet Earth II - Hosted by David Attenborough, whose voice I find totally captivating, this documentary gives you an intimate view of the diversity of our planet. From African savannahs to Amazon rainforests to Polar ice caps, we get an up close and personal look at the heartiest and the most fragile of living things. 4. My Next Guest Needs No Introduction With David Letterman - David Letterman was always one of my favorite talk show hosts. I loved how he was successfully able to combine funny and serious in a way that was entertaining without being too silly or stuffy. Now he's back in the monthly talk show series where he's interviewing a list of fascinating guests from President Barack Obama to George Clooney to Tina Fey. The questions are thought-provoking and curiosity-fueled, which always makes for the best interviews. 5. The Five - If you love reading the novels of Harlan Coben, you'll love this series which is Coben's foray into television. The intriguing series follows four lifelong friends who are forced to revisit a tragedy from the past when the DNA of Jesse, a boy who went missing 20 years prior, shows up at a present-day crime scene. 6. Masterpiece Classic: The Diary of Anne Frank - The classic novel comes to life in this adaptation of a young Jewish girl in Amsterdam who goes into hiding with her family to avoid being captured by the Nazis during World War II. This is one of my all-time favorite books. I wasn't sure I even wanted to go there by seeing this movie, but it was very well done, true to the book, and the characters were almost exactly how I envisioned them while reading the diary.